The sturdy little house was built in 1899 in Burlington, Vermont. “I first saw the house on a Thursday evening in 1998, and I signed the contract on Sunday,” says homeowner Judy Rosenstreich. She’d always admired the rare brick houses of the Vermont countryside, and she’d wanted an old house since coming to the state decades before. Located a short walk from the University of Vermont, this house is just a mile from downtown. 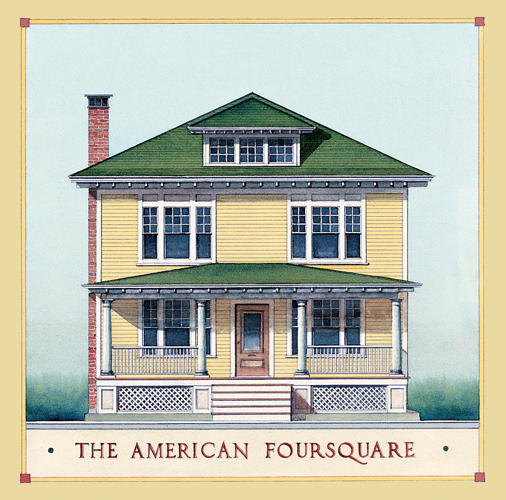 Judy was instinctively drawn to the tidy American Foursquare, but she says she could not have predicted what its restoration would involve. The house had seen little remodeling, a good thing. 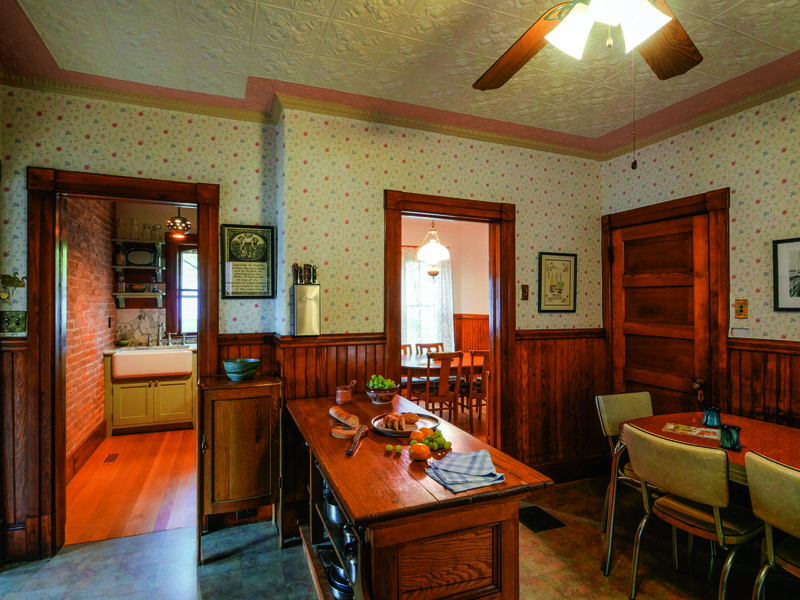 Original woodwork had never been painted, an old tin ceiling in the kitchen was in perfect condition, wall plaster held tight to lath, wainscoting was original in the dining room, kitchen, and bath. Wide-plank spruce floorboards remained under dated carpeting upstairs. Still, the house needed work. Nine plaster ceilings were failing, for example. The living room is comfortably furnished in an eclectic mix of family pieces and antiques. Flooring and woodwork are original. Friends report that Judy went about the fix-up the right way, first things first. Electrical and plumbing were upgraded; a new furnace and water heater installed; and windows restored (all sash cords replaced); tired wallpaper and carpeting stripped away. The late Wilfred Verchereau and his son Lee assessed and replaced plaster ceilings, beginning in the dining room. The house had so few wall switches or electrical receptacles. It was Judy’s then-school-age son Aaron who suggested push-button switches to “go with the character of the house.” Thus began a years-long focus on finding the right sources. Judy hired masons to clean and repoint the brick exterior, and another contractor to rebuild two porches that had been torn down earlier. A local slate company repaired the original roof, which needed work on six valleys and replacement of the deteriorated 1899 metal ridge caps with copper. 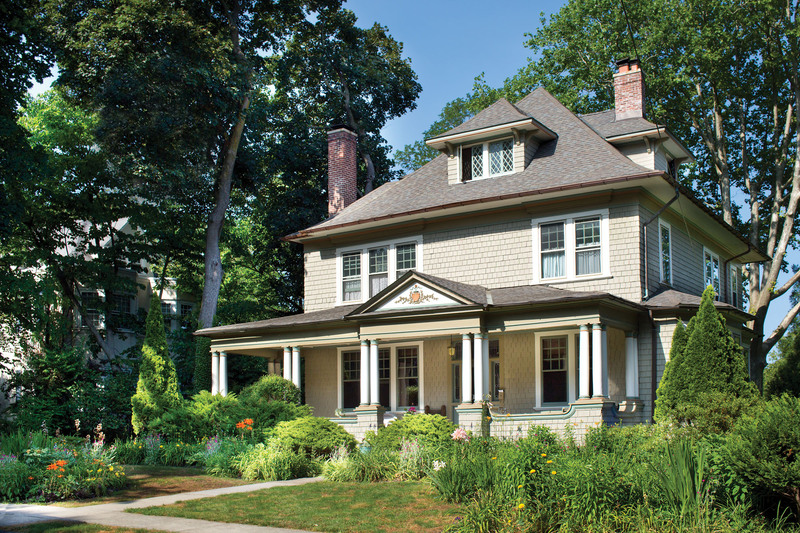 An American Foursquare all but demands a full-width porch. Judy had photographed remnants of the original porch (cement patches and roof-tar stains), establishing a record, and did the same for the side porch. She began to conceptualize a new porch, drawing from photos in OHJ and period illustrations. She took her ideas to her neighbor Doug Viehmann, an architect, who drew a simple plan that allowed Judy to get a building permit. Carpenter Richard Champagne figured out the details. 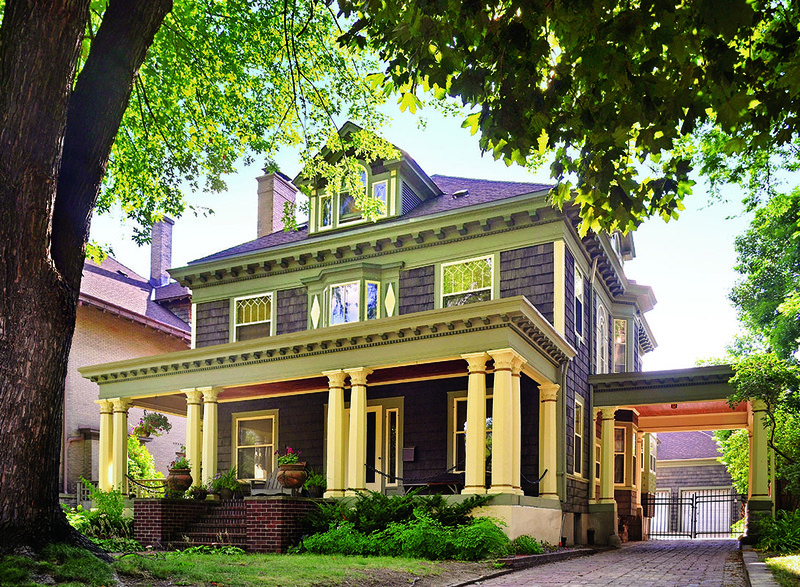 When the porches were completed in 2008, the house received the annual residential award from Preservation Burlington. The kitchen is airy and old-fashioned with a stove at far left, a worktable as an island, and a small dining area to the right. 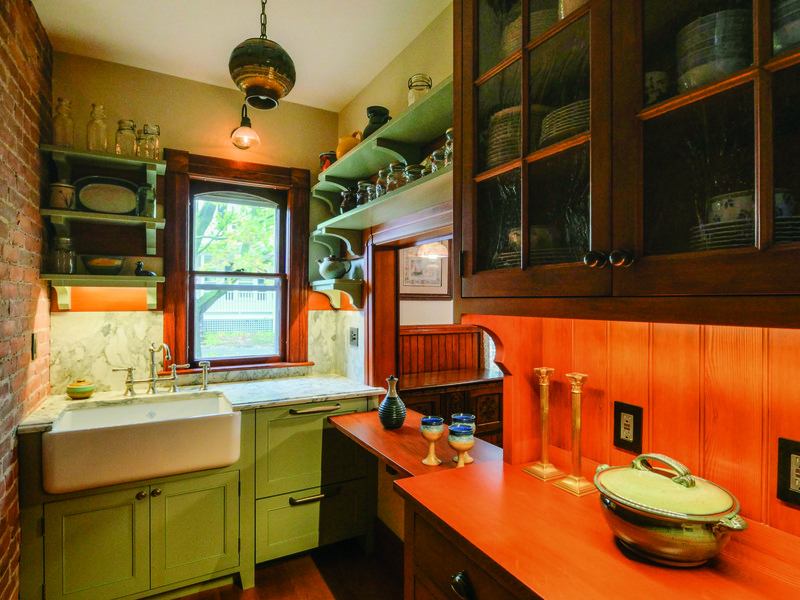 With a big sink, the butler’s pantry functions as a scullery. 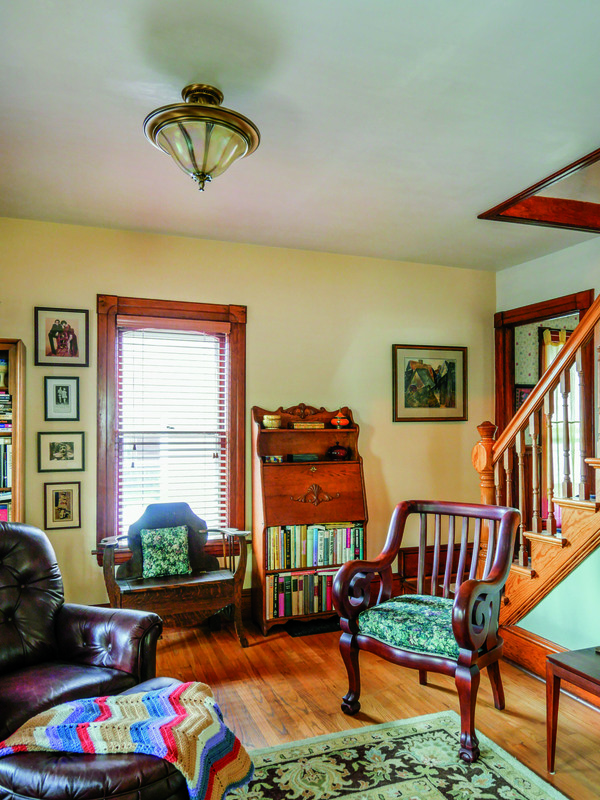 by now, judy had found Montpelier-based architect Sandra Vitzthum—through an article that she’d clipped and saved from OHJ. Judy needed help figuring out how the typically small, turn-of-the-century bathroom could function today. She had researched the era’s bathrooms, learning about 1/8" grout lines, pedestal sinks, and mosaic floor tiles. But she didn’t know how to design the specifics, or how to fit in more storage. A sympathetic architect would make all the difference. In the pantry, the pass-through to the dining room has been re-opened. The serving shelf drops down to allow access to dishwasher drawers. 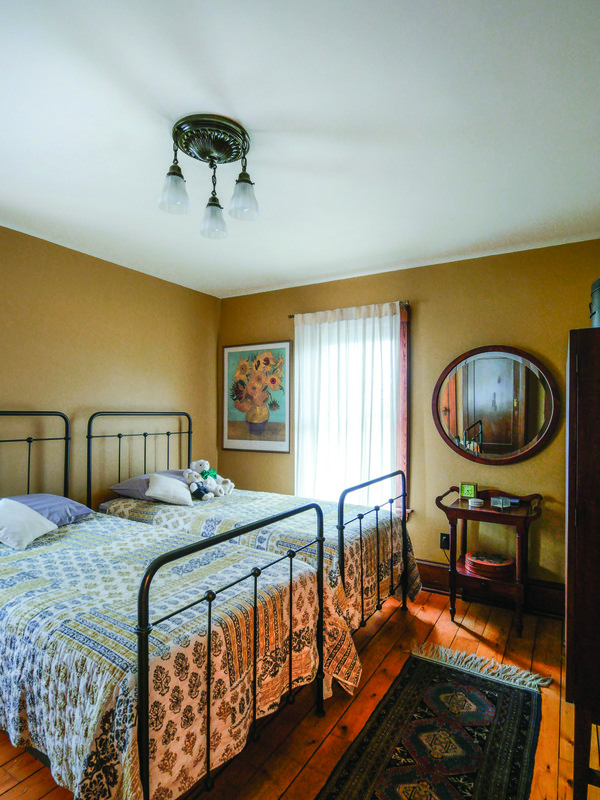 Most of the original wood wainscot was retained; Todd Rheault of Quartersawn Furniture Restoration & Repair repaired and renewed original features right down to the doorknobs. Vitzthum suggested marble subway tiles, marble shelves, sconces to stand out against the white Carrara. 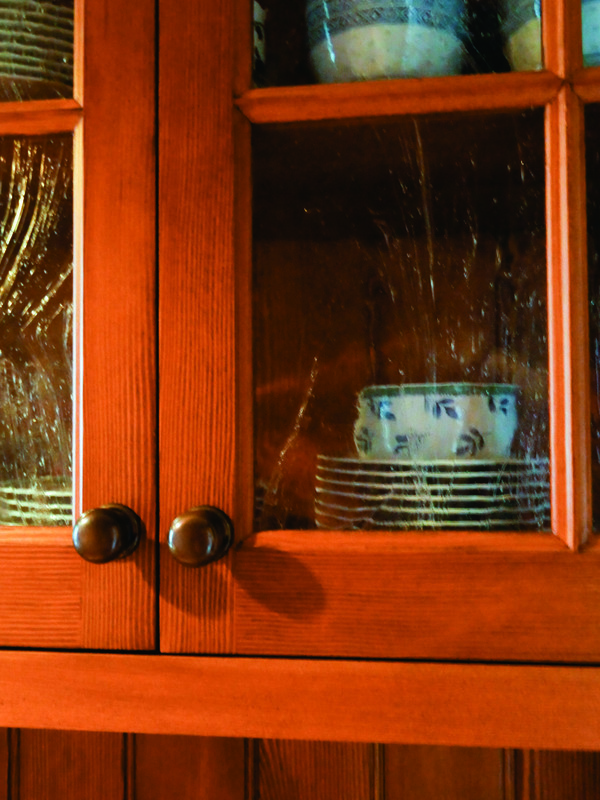 The quarter-sawn oak corner cabinet custom-made by Dennis Bertucci of Utah has a rich, fumed finish. The faucets and grab bars have a period look. Judy had Acme Glass of Burlington change the clear glass of the bottom window sash to the old-fashioned frosted glass pattern she remembered from the New York City apartment of her childhood. Now the window offers privacy while still admitting daylight. The next project was important: the kitchen pantry area. 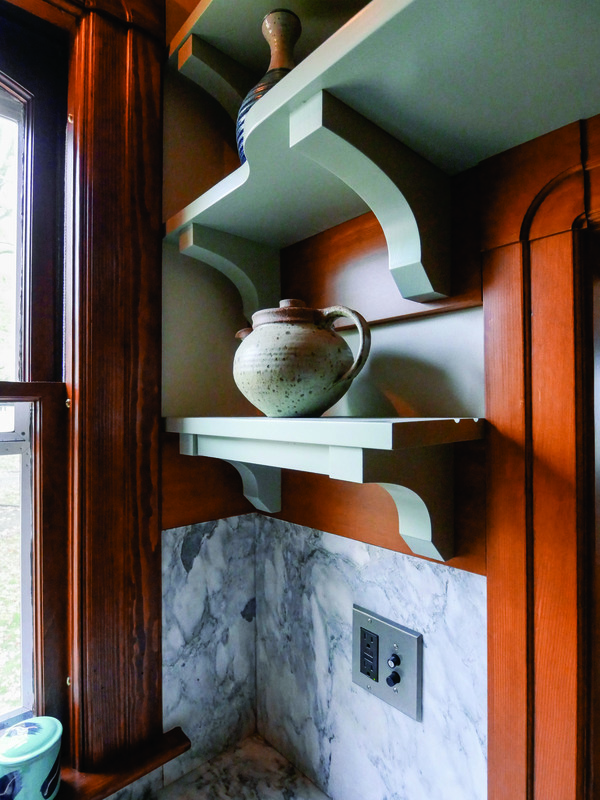 The butler’s pantry was the only room that had been completely “modernized”—with a dropped ceiling of acoustical tile, no original cabinets, the kitchen sink relocated into a pass-through space. The pantry had mismatched, over-painted cabinets, along with 1970s paneling with a wainscot later nailed on top of it, painted wallpaper, and a light bulb hanging over the sink. A boxed-in duct invaded the space. There was no dishwasher. In the master bedroom, the antique washstand came from St. Johnsbury, Vermont. 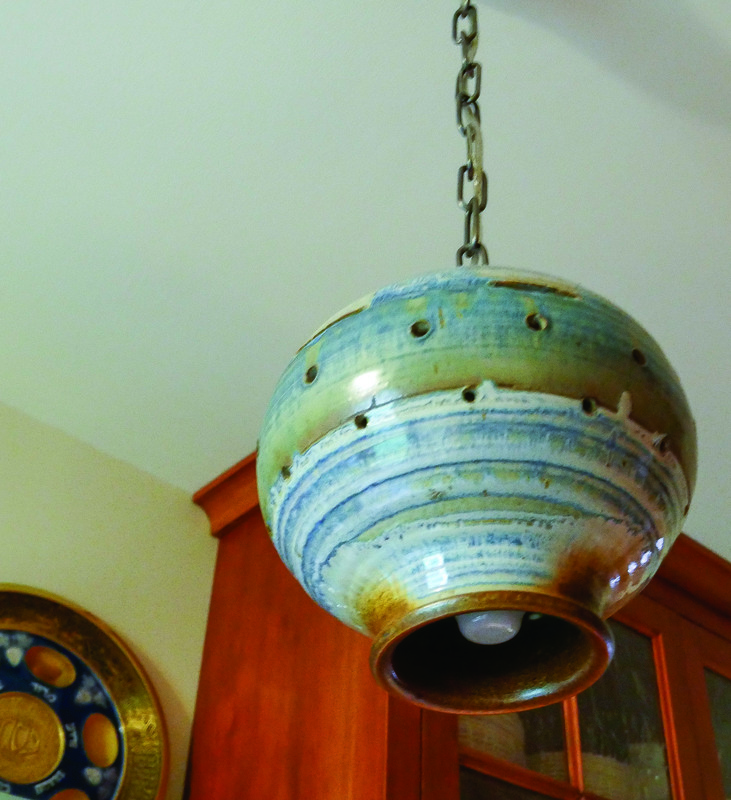 The ceiling pan fixture was salvaged, refinished, and rewired by Conant Metal & Light. Shades are new. At a loss, Judy started by removing all the layers of paper, paneling, plaster, and strapping, exposing a brick wall in the pantry. She decided to live in the space for a while. Stripping the wall had added three inches to the tiny space, and guests seemed to like the warm brick. Finally, Judy asked her architect to take a look at “the butler’s pantry.” Vitzthum saw immediately that re-opening the pass-through would open the first floor to light, air, and movement. The old cabinets and sink were removed and donated, and both pantry and kitchen re-imagined. The front porch was replicated. An enclosed porch/mudroom at the rear of the house was built in 1959 and since improved. 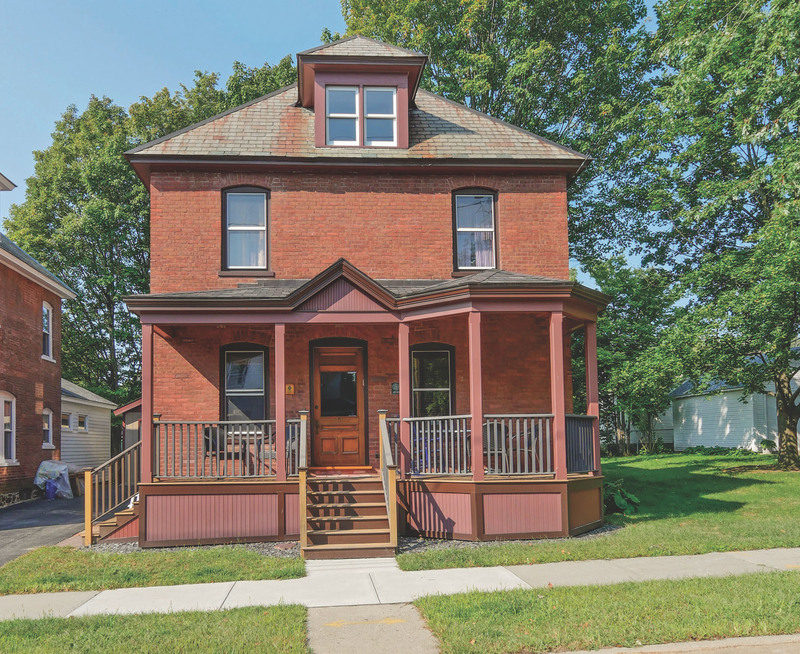 The City of Burlington had a zoning restriction that prohibited building within five feet of the side-yard property line. Over time, as deteriorated wood porches were removed, owners made due with a portico or overhang at the front entry to comply with the setback restriction. Many front porches—along with their social function—were lost. 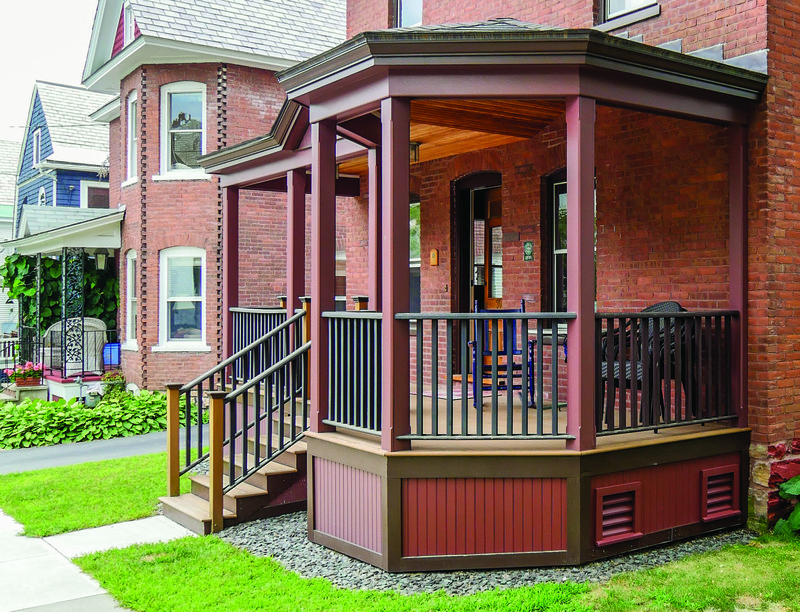 When Burlington was in the process of rewriting its zoning ordinances, Judy Rosenstreich, who is a former member of the Vermont House of Repre- sentatives, went before the planning commission to suggest that, in order to preserve architectural heritage, replacement of open-air porches within five feet of the side property line be allowed, as long as the homeowner had evidence that a porch had been there before and would rebuild with historically correct materials. The commissioners agreed and wrote an amendment into the ordinance. The City Council gave its blessing. In her own project, Judy had evidence, because she’d taken photos before she began restoration of the brick exterior. She had found an expert carpenter and she had a design drawn. The rebuilt porch transformed the house and the streetscape.